KOKOMO, Ind. 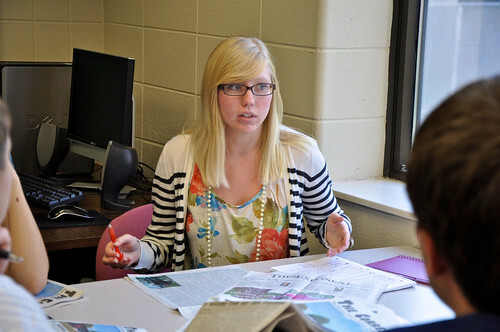 – When student Mary Olk steps into The Correspondent newspaper office each week, she is overwhelmed with the thought, “what can I do to improve the next issue?” As editor-in-chief, she finds her improvement opportunities are endless. Mary Olk leads the staff at The Correspondent meeting. When Olk applied for an editorial position, she had no clue all her ideas would become reality. After the previous editor resigned, Olk stepped up and took off with her ideas. After hiring two new editors to the staff, the new and improved newspaper was in the works. These editors want a fresh, new design for The Correspondent and more stories for each issue, and they are striving to reach just that. Stephanie Barnes, assistant editor, is designing a new masthead, which includes a clean, slim text and a silhouette of a cougar, Indiana University Kokomo’s official mascot. The entire staff is collaborating to redesign the layout by using a variation of bold and regular fonts that flow well together and create a more modern look. More striking and appealing photos will be used to add to the flow of the paper as well. “We are working to improve the look, but above all, we want to improve the content,” said Olk. Faculty Advisor David Brewster couldn’t agree more. “They have really hit the ground running with this, and I think we will have a great end product,” he said. All the editors are excited about a new variety of stories to publish in The Correspondent. Not only are there things happening at IU Kokomo, but also there are newsworthy events occurring within the entire IU system as well as the community. The staff finds it insane to not feature these stories and events as well. Arts & Entertainment Editor Brian Arwood is planning a number of intriguing articles, which will include an opinion column. There are plans to feature book, movie, and food reviews for those that are looking for something new here in Kokomo. Since IU Kokomo has added club sports, player profiles will be featured, too. Sudoku, a crossword, and comic strips are possible new features for the next issue, too. Student awareness and involvement is important to these new editors, so we can except more features of students. A new idea, titled “Six Silly Questions,” will be added to the next issue. Two students will be randomly chosen to answer six silly questions, and their answers and pictures will be featured in The Correspondent. Creating each issue of The Correspondent requires more than writing the stories and distributing the final product. It takes time, planning, effort, and proper communication to ensure each issue is produced smoothly. These editors have had some very productive meetings and great things are in the works. The next issue will be on the stands Monday, October 17. This article was written by Mary Olk. Olk is a junior majoring in Communications at Indiana University Kokomo and is an intern in the Office of Media and Marketing. Indiana University Kokomo serves north central Indiana.